As I mentioned in my last post, the general media panic about total gridlock in LA during Carmageddon could possibly be a replay of LA during the 1984 Olympic games. As it turned out, my forecast was right on. 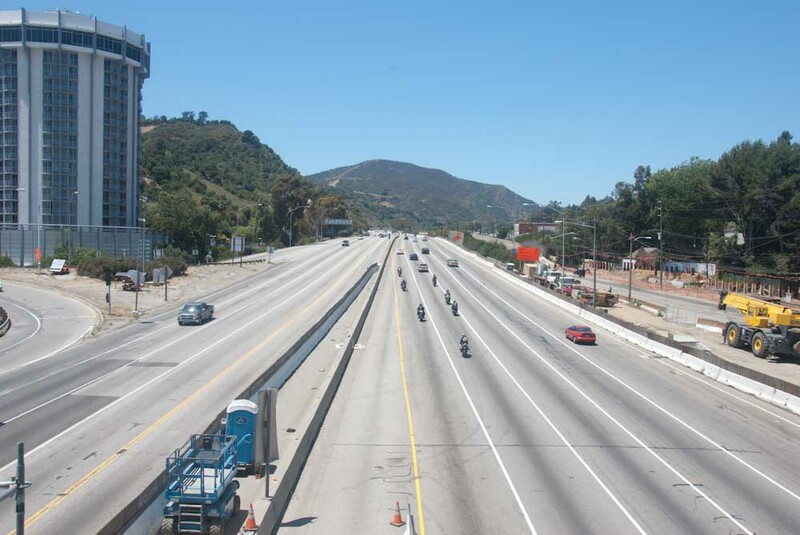 Here’s a shot of the I-405 freeway at Sunset Boulevard, near the southern end of the Sepulveda pass, at 2:00 PM the afternoon after the freeway closure. The only car shown on the freeway is a parked official vehicle. Not only that, all the streets in the immediate area were traveled by only the occasional car. Not only that, the rest of Los Angeles reportedly was also congestion-free. I’d love to say that this wonderful highway emptiness was a result of a sudden interest in telecommuting but this photo was taken on a Saturday, not the usual workday. No, the sudden hiatus mainly was the result of a mass decision to stay home. The bridge reconstruction that triggered all of this was completed hours ahead of time, on the following Sunday morning. Here’s the freeway, from the same vantage point, on Sunday afternoon, same time. Still pretty nice, but the freeway had only been open for less than 3 hours when this was taken. The massteria still ruled. But would it last? As is generally known, the Los Angeles region depends for its economic survival on its cars and freeways. 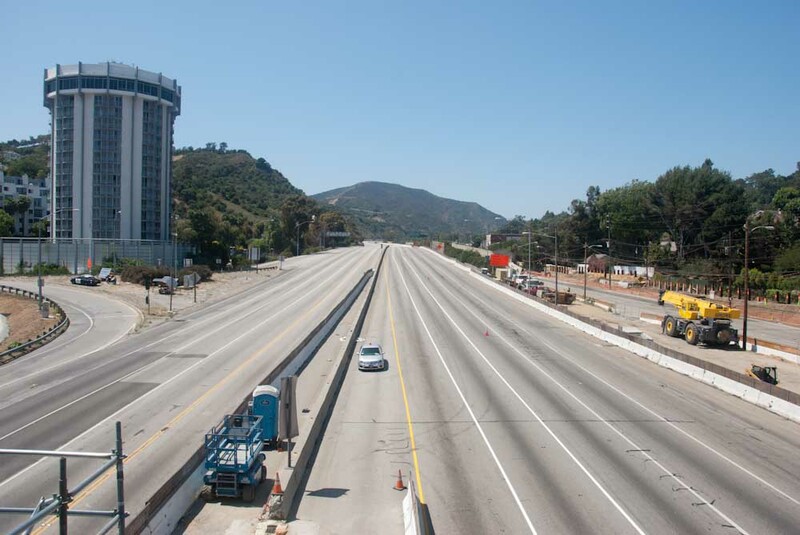 Tomorrow a key section of one of the world’s most traveled freeways, the 405, will shut down for at least 53 hours. This action is to allow demolition of a bridge in Sepulveda Pass as part of the project (costing an estimated $1 billion) to widen the 405. 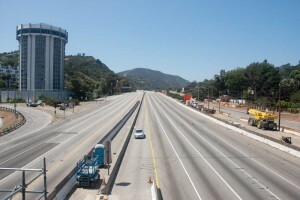 The pass is the principal connection through the Santa Monica mountains between the San Fernando Valley and West Los Angeles. The shut-down allegedly is scheduled for the weekend in order to minimize the effect on business-related traffic, i.e., the daily commutes to and from work. Normally, if such a term can be applied to Los Angeles, the to-be-closed section of the 405 handles 500,000 cars per day during the weekends. So something in the order of 1 million cars are about to be blocked from their wonted activities. Naturally, the local news media have been having a field week over the prospects, calling the impending automotive doom Carmageddon. Also naturally, in accordance with the law of perversity of the human psyche, people who live on one side of the city tend to work on the other side. This is the primary reason for the so-called rush hour; well, it once was called the rush hour, now it tends to be four hours, twice daily. On weekends people, freed from the need to commute to work, still get on the freeways to go shopping or whatever. The word lemmings comes to mind. Why, the imminent disaster might be comparable to that of the 1984 Olympics when similar scenarios were bruited about. Truck travel was confined to non-Olympic hours. In short, millions of people quickly adapted to the need not to travel. Could this happen again?